If you have an exposed beehive, give our team a call today for safe removal. Many of us grew up watching a certain cartoon bear who was constantly on the hunt for honey. While this adorable little fella was able to trick and persuade the bees into letting him into their beehive, the actuality of this happening is slim to none! In fact, if you see an exposed beehive like the one in that cartoon, the first thing you need to do is call our team here at Florida Bee Removal! 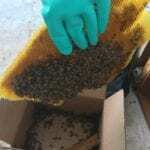 Here at Florida Bee Removal, we have decades of experience removing and relocating all kinds of bees, including the removal of exposed beehives. With exposed beehives, special caution is used to ensure that the hive doesn’t fall to the ground, which can cause the bees to become angry and potentially deadly. We can professionally and carefully remove exposed beehives on your property while maintaining tight security and safety measures to ensure that the only thing hurt during an exposed beehive removal is the pride of the bees who built it! With 300 to 400 bee removals every month, you can feel confident that calling Florida Bee Removal to your Lakeland, Florida property is a good move. Not only will you be able to get rid of your exposed beehive, but you can take comfort in the fact that we are able to successfully relocate many of the bees that we remove. If you see an exposed beehive, don’t touch it! Instead, give our experienced team of apiarists a call today here at Florida Bee Removal. We would love to talk with you.